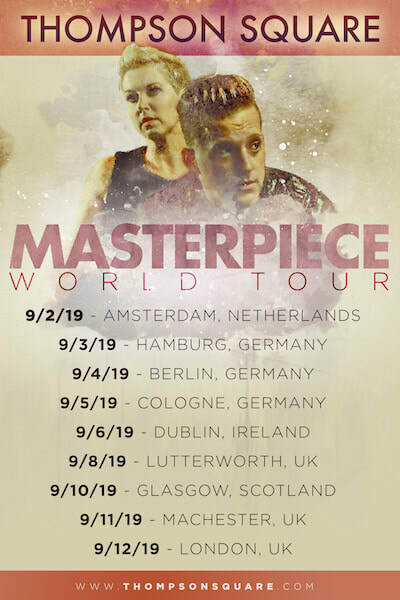 Grammy-nominated, multi-platinum Country duo THOMPSON SQUARE are opening a brand new international chapter of their career this fall. The hit-making team of Keifer and Shawna Thompson will embark on their first-ever overseas tour in September. Booked to hit five countries in Europe and the United Kingdom over 10 days, the whirlwind trip will kick off in Amsterdam on September 2nd and visit Germany, Ireland, Scotland and The Long Road festival before wrapping with a show in London, England, on September 12th. "Today is the realisation of something that has been a long time coming," says the duo's Keifer Thompson. "We are so excited to announce tour dates that will take us all over this big world and can't wait to finally meet so many of our fans. We'll see you all soon!"